The girl is dancing at the center of the plaza, her arms and legs up in the air, her look of confidence as the circle of women watch delightfully. Her smile is sincere, she is focused and she is enjoying herself. The picture of the dancing girl is at the center of my vision board. A girl with a turtle, she is swimming, the picture is taken from below, she is floating pleasantly in the ocean. A woman sitting near a waterfall in the middle of the jungle, a mother and her child, resting peacefully at the beach, a picture of a book, a lady practicing yoga, and the words “your authentic self.” All these images make part of the whole picture. Each one holding a meaning for me. The idea of a vision board is that we place the board somewhere close where we can see it, and we can be inspired by it. Looking at the images regularly will remind us of what we are pursuing in our future. Envisioning is key to help make our dreams come true, and my son was very clear in his vision for his board. First in line: a huge hot dog and an energy drink. He didn’t have to think those through. I took a minute to encourage that he think about the future, asking the questions: What do I want? Soon enough, a soccer ball, then a player showed up, my son was excited. A tent for camping, and a picture of boys having a good time. My son was busy collecting pictures, cutting them up and gluing them to the board, and I could see he that he was having fun. This wasn’t the first one for him, Grandma had helped him put a vision board together some time ago. An hour later, we had finished our boards. Mine was full of blue tones (my favorite), and at the center, the word: Laughing. This was the word that inspired me on that sunny afternoon. The thought behind this? I want to laugh more at life, even when things are not going exactly as I’ve planned them. Laughing is my deepest desire for this year. Resolutions aside, I’m adding laughing and dancing, especially with my son, to my fav’s list. How about you? 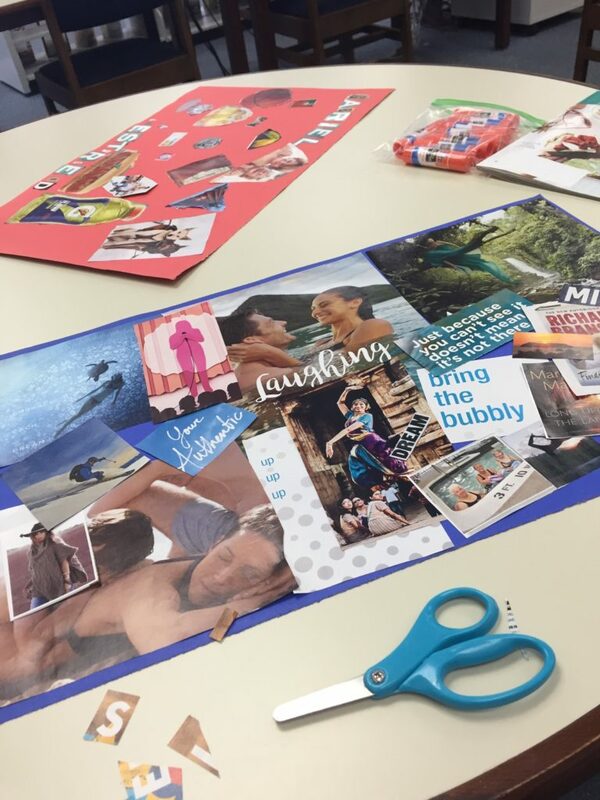 Do you have a vision board? What are your desires for the year ahead? Your post gets me excited about building my own vision board! I’m so glad you enjoyed the program at the LA Ray library. May I share a link to your blog on the Cobb County Public Libraries Facebook page ?